STARR COUNTY – With the assistance of the Starr County Industrial Foundation radio station KRGX ESTRELLA 95.1 FM, “La que brilla en el Valle,” held its grand opening this past Wednesday, October 16. “We are a radio station that will play diverse music, from Mana to Ramon Ayala, because we know that the majority of our listeners don’t stick to one genre,” said Hugo A. Ramirez, General Manager of the station and one of the on air radio personalities. “We knew this region was ready for a new radio station, one that caters to our Norteño style and to our taste in rock and pop music,” he added. Serving as Mistress of Ceremony for the event was Rafaela, local TV and radio personality. Starr County Judge Eloy Vera welcomed the station and thanked its investors for believing in Starr County. Rio Grande City Mayor Ruben Villarreal commented that the name of the radio station was fitting of the realization of the project, since you must reach for the stars to make things happen. Represented by Dr. Jose Vasquez, the investor group responsible for developing the station was thankful for the support he and his partners have received from the local community. 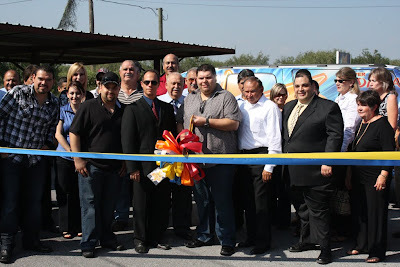 The guest of honor was the County’s homegrown shinning star Grupo Duelo who participated in the ribbon cutting. Oscar Ivan, lead singer for the group expressed his delight and excitement in seeing the continuing growth of this area that he proudly calls his hometown. Also in attendance were members of Grupo Solido and Grupo Odisea. A reception followed the ribbon cutting where guest were entertained by Ricardo Jr. el Tejon del Corrido. KRGX ESTRELLA 95.1 FM is proud to be in the area and wants you to call in your music request at 956.487.0951, “We are more than a radio station, we want to connect you to your family and friends through the air waves,” said Rafaela. “The distance is minimized when you know people are thinking of you,” she added. You people should of never sold that station to Gerardo Gonzalez.